Never understood how PayPal’s system designers thought. We just have one question to you: Don’t you have a data table or user profile configuration files to store existing customers or users’ existing settings? How could you force existing customers or users to set their Preferred Payment Method again and again? Every time when your website upgraded, our previous Preferred Payment Method setting will be wiped out. 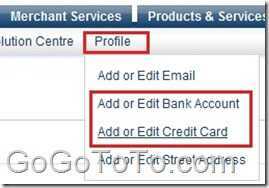 At least from earlier years of 2013, to 2013, then to now, we had to set the Preferred Payment Method 3 times! Normally you have at least 2 different payment method are binding in your PayPal, the one is debit bank account, another one is credit card. When you set your bank account and credit card in your PayPal, normally the payment will choose your PayPal balance first, and then credit card, and then bank account. In some case, for example, your credit card expired, then PayPal will charge money from bank account, here we might get problem: if your bank account balance is 0 or less than the payment amount, your debit bank might charge you extra money for a fine due to their own policy, then your PayPal payment failed, also you get bank fine. That is headache problem. So for this case we’d better force our PayPal charge money from Credit Card always. Note: Just click Profile, DO NOT select sub menus which in the list. 4: Now we can adjust our funding sources, for example, Check off any Bank Account option, save it, then your future payment will ONLY charged from Credit Card. If you have already a PayPal account, the one thing you have to care about is that your credit card might be expired after some years, and also your bank account maybe changed. So if you want to continue to use your PayPal, you have to update your financial information in your PayPal. The updating work is easy. Login to your PayPal account, find Profile menu item on the top menu, you can see there are “Add or Edit Bank Account” and “Add or Edit Credit Card” sub menu items there. Your first name and last name will be auto filled by system, what you should do is drop down the Card Type and select one which matches your credit card type, and then input card number, expiration data , and Card Verification Number which normally are on your card back. 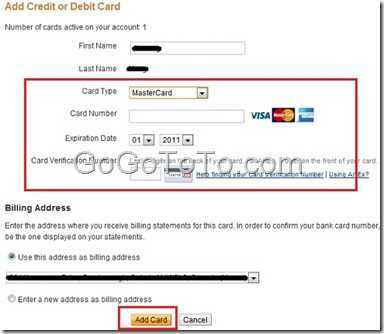 And then confirm your Billing address, After you review all information is correct, click the button “Add Card” on the bottom, your new credit card will be added then. Paypal’s develop team is going to use X.com to be a new platform to provide API to be the first and only global payments platform open to third-party developers. You may have heard some breaking news that PayPal will be the first and only global payments platform open to third-party developers. Indeed, it’s true. Take a look at the PayPal Blog entry Osama Bedier (VP of platform and emerging technology and my boss) posted earlier today. It talks about our limited-seating preview event on July 23rd where you can get more details on the APIs, as well as our developer’s conference in November. This is game changing stuff, and we want you to be part of it. We believe that providing a global payments platform will open up countless opportunities for developers to innovate and create new revenue streams. We want developers worldwide to easily make money from their ideas. Let me take a minute to thank the developer community for the overwhelming response. It has been amazing. To be part of the action, follow PayPal Developer on Twitter and visit us on www.x.com as we begin to roll out our new services and capabilities. Paypal have owned the domain X.com since 1993 (or earlier) but few people knew it because seems Paypal never gotten good idea to use it. Paypal will move towards the public launch this fall. The team is currently using X.com as their blog to note somethings regularly.